For the last couple days I’ve been watching a new water well being drilled on my property, so I’ve had to hang around and throw circuit breakers, and otherwise make sure the house didn’t burn down. The result is that my self-publishing efforts got a boost, mainly because there was nothing else to do but work. Two stories in two days! Rah! 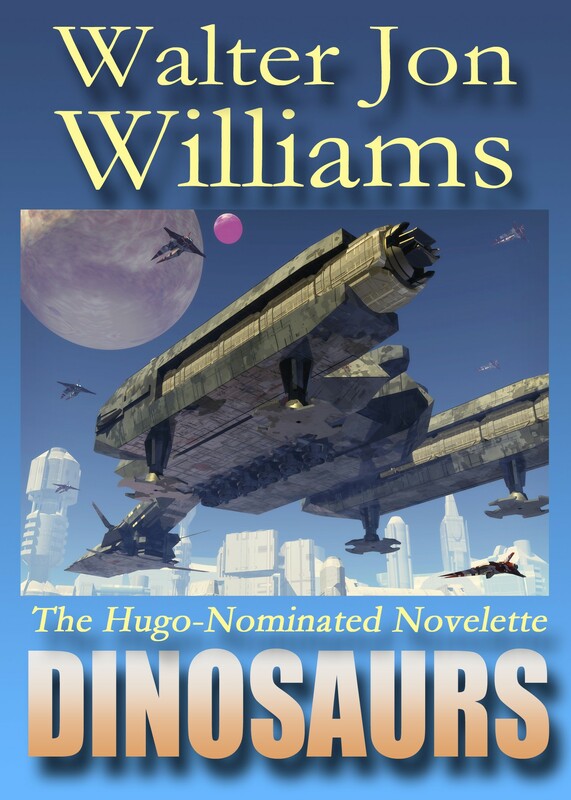 I’m pleased to announce that the house now has sweet water for the first time in, well, ever, and that my Hugo-nominated novelette “Dinosaurs” is now available via Amazon, Barnes & Noble, Kobo, Baen, and Smashwords, and it will be available in other forums shortly. It’s only $0.99. Spend like the wind! This may be autobiographical, albeit at some remove. At one point in my life I watched an aneurism turn my father from a vital, active man into a semi-invalid with no particular purpose in life, and whose needs were taken care of with perfect efficiency by his devoted spouse. He was far from senile, but he was wandering through existence without quite knowing who he was anymore, and that situation produced in me more than its fair share of terror. I was not afraid of mere senility, but of senile systems: governmental or societal systems that had lost their reason for being, but which still wielded power without quite remembering what it was for. In “Dinosaurs,” the entire human race has grown so vast and over-specialized that any actual reason for its existence seems to have been lost. The story was first sold to L. Ron Hubbard, of all people. He had just announced a science fiction magazine, and was paying top rates. I figured if such venerable figures as Jack Williamson, Fred Pohl, and Roger Zelazny could be a part of Elron’s various publishing enterprises, then so could I. The check arrived on the very day the news announced that Hubbard had died. “Better cash the check quick,” I said to myself, and did. Somewhat to my surprise, the check cleared. Unfortunately that meant that Hubbard’s publishing company still had the rights to the story, even though the magazine was canceled shortly after Hubbard’s death. So it was two or three years later that “Dinosaurs” actually appeared in Asimov’s, was nominated for a Hugo, and lost to Ursula K. LeGuin. “Dinosaurs” has been one of my most reprinted stories, and is probably my most popular story in Eastern Europe. After all, if they don’t know what it is to be conquered by a vast, powerful, alien, and senile political system, who does? “Reno, are you there?” Cowboy says. Reno doesn’t get a lot of page space, and arguably isn’t necessary to the story as a whole, but he was a very memorable character. Er, for those who haven’t read “Hardwired”, Roon was the bad guy. Cowboy set Roon up for the fall, and then Reno ate his soul, basically. Hardwired and Neuromancer are very often compared and I’m about to do it again. Myself the two books are the two major seminal Cyberpunk (TM) works. William’s Reno and Gibson’s Dixie Flatline were always interesting contrasts in characters. Sad that the vagaries of publishing has resulted in Hardwired being unfairly treated as somehow late to the party. Reno and Dixie Flatline are very similar in function and role. Reno, however, is much more self actualizing and not as constrained by circumstance than than Dixie Flatline. Reno breaks out of his own box while Dixie Flatline flees into a box and needs to be broken out. In some ways this mirrors the popular conception of the US West and the US South. In Westerns characters create their own reality in Southern Gothic people are stuck in their social reality. This in a lot of ways demonstrates a lot of the differences between Hardwired and Neuromancer and both Williams and Gibson’s personal backgrounds and histories in some ways. In tone I’ve always thought of Williams as a Western writer and Gibson as a Southern writer. The issues and solutions are often the same between the two but how characters get there are different due to different conceptions of how the world works. Those who will get to read this for the first time are lucky. I think Dixie showed up in some of Gibson’s earlier work too. I wasn’t very fond of “Neuromancer” when I first read it; it looked like it had been frankensteined out of loose story bits, which I later found out to be the case. And the characters were mostly batshit crazy or simply reprehensible… the main redeeming scene in the whole novel was similar to Walter’s description of Roon and Reno; a true Western-style confrontation between Maelcum, the Rastafarian stoner, and Hiro, the “vat-grown Ninja assassin.” The confrontation lasted about one second; Maelcum lost. In the sea of nasty characters, Maelcum and Hiro were oddly innocent; Maelcum was doing his best to fulfill a contract he had no part in negotiating, knowing pretty well that he was on a suicide mission. Hiro was a killer, but he was created as one; he was just following his weird, much like Steward was when he was working for Colonel de Prey. For all that, I really do like the ending. It just doesn’t seem to fit with the mega-downer nature of the rest of the book. I also always wonder whether Snow Crash was intentionally based on Hardwired, or whether it’s just that HW was just such a strong influence on the cultural perception of cyberpunk. I’m okay with thinking of myself as a Western writer. Hadn’t thought of Gibson as a Southern writer, though of course he is. That’s an interesting analysis. Black Mind was a vast improvement over what my editor originally wanted me to do, which was have the Orbitals slag each other with nerve agents and atomic weapons. Somehow mass genocide equaled a happy ending. I mean, I know =some= of them were bad, but jeez . . .
Really? You did a heck of a job setting things up for it, then. Orbitals slagging each other… though completely in line with the usual nihilism of the genre, it’s BORING. If I want stupidity, depression, and nihilism, I can just read a newspaper. I don’t require happy-happy joy-joy, or even a John Campbell level of optimism, just that someone in the book comes out ahead in the end. Oddly, Steward’s end in “Voice of the Whirlwind” didn’t affect me the same way as the end of “Hardwired.” Steward Beta wasn’t a nice person, and was on a death run from the beginning, but I was still rooting for him as the underdog. You had done such a good job of differentiating between Steward Alpha and Steward Beta that it was obvious Gamma was an entirely different individual, not a continuation of identity. But Alpha and Beta had both been born to lose, and both had, basically, sacrificed huge chunks of their own identites for chances for a fresh start. For some reason I didn’t realize that the first time I read the book, and my reaction was WTF?! It wasn’t until later that I realized what was going on. Of course, one definition of a really good novel is that you get a little more out of it every time you read it. “Nihilism of the genre.” Hey, it wasn’t a genre YET. Voice of the Whirlwind is my favorite book of yours. It has my all time favorite bit of all your writings (that I’ve read which most of it). The part at the beginning where Steward is in the hospital with freedom to walk around, the bit where he pushes his color coded bracelet up his sleeve because he doesn’t want people thinking he’s crazy. That part really humanizes him and the paragraphs around it really just flow nicely for me. There are just a lot of nice touches. In the big picture, a Cyberpunk (TM) story with aliens was nice because most of the writers in that “not yet genre” explicitly rejected aliens for the most part, “We want to write about people not kiddy stuff (sulk/glower).” I also really liked: the swimming homunculi; the Canards Chronique; the hussars coat; and the rejection of the bloody “performance artist” after Steward determines no tricks are involved. It’s just a fine read. Thank you, Brian. I’m fond of that book, myself.